"Those aren't insects trapped in a spider's web -- they're stars in our own Milky Way galaxy, lying between us and another spiral galaxy called IC 342. 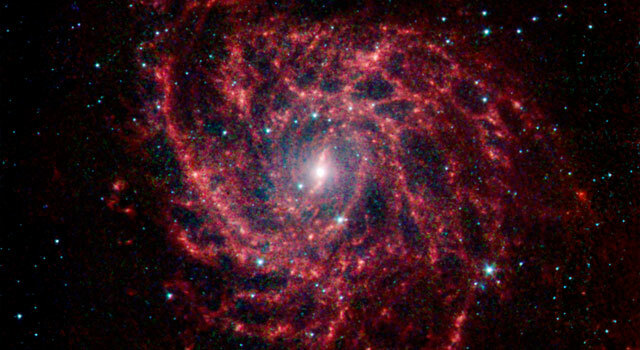 NASA's Spitzer Space Telescope captured this picture in infrared light, revealing the galaxy's bright patterns of dust. At a distance of about 10 million light-years from Earth, IC 342 is relatively close by galaxy standards. However, our vantage point places it directly behind the disk of our own Milky Way. The intervening dust makes it difficult to see in visible light, but infrared light penetrates this veil easily. While stars in our own galaxy appear as blue/white dots, the blue haze is from IC 342's collective starlight. Red shows the dust structures, which contain clumps of new stars. The center of the galaxy, where one might look for a spider, is actually home to an enormous burst of star formation. To either side of the center, a small bar of dust and gas is helping to fuel the new stars."